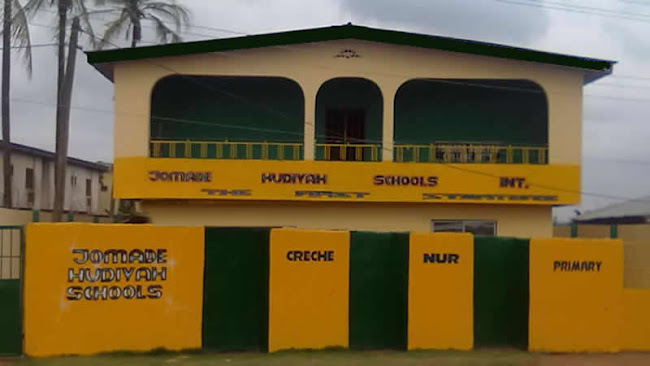 Jomade Hudiyah Schools International was found in 1986 as a co-educational, Islamic Nursery and Primary School with the goal of breeding future leaders that are well trained in a balanced education system, with the tools required to attain high standards of faith, academic and moral virtues. Languages Taught: Arabic, English, French and Local Nigerian Languages. The school was established in January, 1989 formerly Jomade Islamic Nursery/Primary School as one of the pioneering Islamic schools in Alimosho Local Government Area of Lagos State. Jomade, a co-educational Islamic institution offers a unique opportunity for a balanced education (Western Orientation and Islamic Education) for children and adults in the state. It has grown steadily from Nursery, Primary through High School and now to Hudiyah College. It has produced numerous products to feed many tertiary institutions in Nigeria, most especially in the South Western Nigeria. The School Participated actively and performed brilliantlly in many programmes. Among them are: Radio Lagos Children Programme, Radio Lagos, Lagos Television (LTV 8), The former NTA 7 and NTA 10 programmes such as Quranic Contest, Ramadan Talks, Children Entertainments both in English and Yoruba programmes, Discussions and Interviews etc. from 1992 till date. The School won gold medal in The maiden NTA 7 End of Ramadan programme, The Rauf Aregbesola Ramadan Quranic contest and many more. To apply for admission, simply download the admission form below, print a copy, fill it and attach necessary documents as may be required. Then submit the completed admission form with attached documents along with the application fee which varies for each type of form to the school. For details on fees, pricing and other details, contact us.